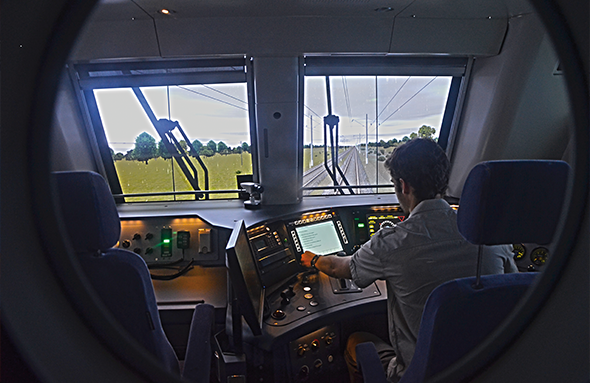 Although driving simulators are purchased by rolling stock manufacturers, the main reason is to supply them to their clients, rail operators. In addition, some operators insist on delivery of the simulator being one of the contractual milestones for the rolling stock manufacturer. This apparently small part of the overall order is therefore in fact one of its strategic components. The further the contract progresses, the more important it becomes: as delivery of the first locomotive or train approaches, training the operator’s drivers puts all the parties concerned under a lot of pressure. A number of questions might arise: do they need a fullscope simulator, a simplified train model, or specific computer-generated images? Do they want to simulate emergency situations or breakdown repairs? Do they have any other driving-related needs such as a new line or a new signalling system? Over the past few years, a second scenario has been emerging: manufacturers purchase a simulator for their own purposes, using it as an engineering tool, to shorten the development cycle of the rolling stock. This enables manufacturers to test and validate their instrumentation and control systems: in this case, the I&C system is either encapsulated or stimulated by the simulator, allowing virtual trials to be carried out throughout the development cycle. Another application relates to the validation of a signalling system such as ETCS. Here too, simulator tests make it possible to test more extensively while carrying out fewer tests on a test loop or real track.